The U.S. Department of Education, National Blue Ribbon Award is one way to assess the academic impact of a curriculum or program. 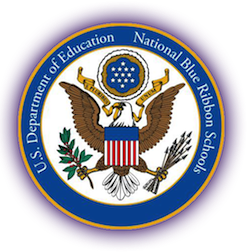 The Blue Ribbon is widely considered the “highest honor a school can achieve”. This is because the Blue Ribbon is not just a measure of minimal compliance or simple standardized test scores. It is a much more comprehensive assessment, involving a multiplicity of objective criteria that allows teachers, students, parents, and community representatives to assess the school’s strengths and weaknesses and develop strategic plans for the future. Based on such criteria, few schools even receive the mandatory site visit for Blue Ribbon consideration. “LabLearner science has been a spectacular addition to our curriculum. Our students have developed a more sophisticated desire to learn at higher levels. Their intrinsic motivation has been enhanced by the infusion of our LabLearner program. We have students who demand that their parents allow them to come to school on lab day even when they are not feeling well. That’s a fact! The LabLearner teacher support is fabulous and we would highly recommend this meaningful learning system to any and all school districts. The LabLearner system was a major ingredient in our being named a National Blue Ribbon School“. – Doug Jacobson – Superintendent, Barnes County North School District, ND. “We used science and specifically LabLearner as the main curriculum area in our Blue Ribbon application. It provided a unique way of making science academically advanced while making learning fun for the students. I do think it was an important piece of why we received the National Blue Ribbon Award. We also highlighted the program in applying for a number of different science and math grants. Parents and other visitors are amazed by what is available through LabLearner. The materials are excellent. The children are extremely well prepared for high school.” – Sister LaVerne King – Principal, Christ the Teacher School, DE.